Many tabletop roleplaying games and many digital games have a game mechanic called the “critical roll.” With this mechanic, a particularly good skill roll, say a 20 on a 20-sided die, can be a “critical hit,” which is better than a normal success. Likewise, a roll of 1 on a 20-sided die could be a “critical failure,” a “critical miss,” a “fumble,” or a “botch.” Critical failures result in an especially bad outcome. Critical rolls typically represent the fickle hand of luck. Even in a game where randomness determines every important outcome, it is possible for characters to get especially lucky or unlucky. Sometimes, that arrow flies just right and hits the dragon right in the eye. Critical hits are often a cause for celebration among tabletop roleplayers, and critical misses are moments of frustration and (usually good-natured) anger at the game and the game master. Many digital games that use tabletop RPG-like mechanics also use critical roll systems. Notably, the action-focused game Team Fortress 2 also incorporates this mechanic in the form of random critical shots, which do more damage than normal shots and are more likely the more damage a player does. Like many tabletop roleplayers, I’m working on a roleplaying system of my own, called LORE. During the development process, I’ve done a lot of thinking about a lot of the common elements of tabletop RPGs, and critical rolls has been one that I’ve focused on. I’ve decided that critical rolls have a part to play in game mechanics, but that there are many pitfalls that should be avoided. Here are my thoughts. 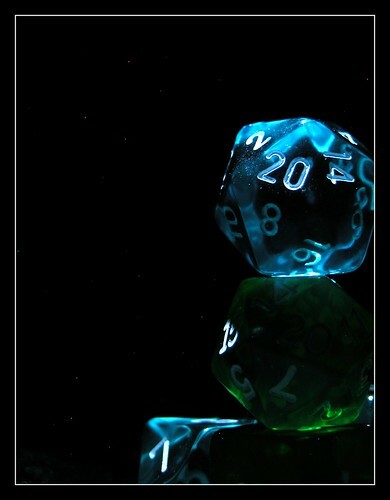 Critical rolls, or crits, have positive and negative effects for the game experience. On the positive side, crits excite players by adding the potential for a pleasant surprise. They also fulfill the narrative desire for “one-in-a-million shots.” We are used to fictional characters triumphing over impossible odds, and crit successes allow them to do so. At the same time, critical failures serve to show that even the most gifted hero sometimes screws up. There are negatives to crits, though. First, it is often unrealistic for, say, a peasant to have even a 5% chance of penetrating a dragon’s hide with a balsa-wood chair leg. Likewise, it is a bit out-of-character for a divine warrior to have a 2.5% chance of losing his grip on his sword when trying to hit a grumpy-looking housecat. More seriously, however, is that crits, especially critical failures, disrupt the flow of the game and can generate frustration. Sudden, catastrophic failure is especially prone to tearing players out of the game. Instead of sympathizing with her character’s slip-up, a player is more likely to blame the dice, an out-of-game item. When I set out to construct my dice-rolling system for LORE, I sought two things: to maintain the excitement of critical rolls while minimizing the amount that critical failures break immersion. I’m fine with the lack of realism; LORE is intended to be very narrativist or cinematic, where things happen more for the sake of the story than for the sake of simulation. To do this, I made critical rolls more frequent, in a way, and also changed critical failures to involve the players more deeply. The basic roll in LORE is 2d6. This is supplemented with modifiers and then compared to a target number based on difficulty; if the total is greater than or equal to the target number, the roll succeeds. A roll of two ones, or snake eyes, is an “interesting failure,” which I will describe in a moment. If the dice result is any other “double,” that is, two of the same number, the player re-rolls and adds the second roll to the total. Doubles can cascade; if the player rolls doubles on the re-roll, she re-rolls again, adding that third roll to the ongoing total. This system already contains the excitement of randomness. About 15% of rolls will result in re-rolling, which makes players feel lucky. However, these rolls are not automatically spectacular successes; re-rolling only increases the chance of a normal success. A true “critical success” happens when the total roll, with modifiers, exceeds the target number by 10. Both critical successes and critical failures in LORE borrow something from the more collaborative “indie” tabletop RPGs. When a character critically succeeds or fails, her player gets to narrate the results of that roll. That is, the player decides what is interesting or exceptional about the success or failure. This is intended to make critical hits more exciting and narratively interesting, while making critical failures serve the story and sting a bit less. If a player rolls snake eyes, she gets to decide how and why her character critically failed. Maybe a lecherous warrior was distracted by his opponent’s beauty. Perhaps the soma-addicted space trader suffered from withdrawal at a key point in negotiations. Regardless, it turns a random frustration into an opportunity for characterization and creativity. On the other side, a critical success lets the player show off her character’s special flair. Using this system means that a GM must give up some of her control over the outcome of the game. As a GM myself, I know how painful that can be. However, in a friendly, collaborative environment, letting the players take the reins for a bit shouldn’t cause too much hardship… and the GM always has the option of vetoing a particularly disruptive choice. I should note that this idea is not wholly original; it is inspired by other systems I’ve seen in my reading. I have yet to test this system, so I can’t speak to whether it works in the real world. However, I think it has the potential to be fun and interesting. What’s your reaction to this system? Do you think it addresses the issues I discussed? Does it present any new problems? Have you seen something similar before? Please let me know in the comments. I like the idea of being “interesting” instead of critical, and the cascading re-rolls is a good mechanic (for some reason all I can think of is farkle, but that’s because of one particular game when I went from 2000 points behind the other players to winning in one turn, which one could say is a critical win) that I don’t think is used enough. It’s simple and effective. And then just going high enough makes it critical, and this makes a lot of sense. I’m interested to see it in action with modifiers and such in actual…encounters (since I doubt it’s going to be a combat centric system). Only question I have is about what the mechanical results of an interesting fail is. in games like D&D, if my warrior critically fails attacking a goblin, he could be disarmed and have to spend a turn running to pick up his axe, or he swings and hits his foot by mistake and looses some health, or it gets stuck in a nearby wall and he needs to strength check to get it back out, etc. How is this handled? Is there still a GM determining what the negative effects are, or is there some sort of standard “fumble” that happens? (perhaps even like a fumble roll, deciding what kind of negative effect happens.) I’d believe the later might be more effective, because then players wouldn’t have to think about what happens and would go for the why it happens that you mentioned. If I know that there’s a GM sitting there who just semi-arbitrarily decided how I messed up, I’d be too upset to make up some bits about the goblin back alley fighting league that this particular one spent his youth in which makes him a bit more agile then normal goblins. But if there’s a rule that says “when you fail hard enough, this / one of these things are what will happen” then I’d feel it’s more of an inevitability, and I wouldn’t bother holding a grudge over it. The mechanics of an interesting failure depend on the situation. Usually, they should be clear from the player’s description. If the player decides she drops her axe, she drops her axe and has to spend a turn getting it. If she freezes under the pressure of interrogating a witness, then she continues to roleplay with the witness knowing her character isn’t so confident. In some cases, there is a mechanical consequence, like a loss of hitpoints or a roll to recover. However, these consequences are determined *after* the player narrates the interesting failure. Hopefully, there won’t be a grudge when the GM says to mark off a health level, because the player decided that she accidentally shot herself in the foot. It’s the player’s choice what occurs, so she has some control over the mechanical outcome. As it’s an intentionally lightweight system, I’m trying to keep the rules simple, so there are few rules that guarantee specific results of interesting failures. I’m all for lightweight rules. I’m just also thinking in the case that you have players who try to BS the lowest impact outcome in a given situation. Obviously something bad is going to happen – the dice determine that. But in the event of a lackluster player, do you have a means to make the player choose a bad outcome that’s more then “it just doesn’t work”? Exactly. If a player isn’t fully invested, then it’s fundamentally a social problem. The system can encourage players (and GMs!) to roleplay, but in the end it’s at the gaming table that roleplaying happens, not at the author’s desk. I’d actually argue that it’s fine for a player to BS a low-impact outcome. The purpose of critical failures, in my opinion, isn’t to screw over players; it’s to make the game more fun and the story more engaging. If a player doesn’t feel like narrating a particularly bad failure, and the others at the table are fine with that, then it’s perfectly okay, as long as it’s fun and the story is progressing as the GM and players desire. I have been looking over all the info you have listed, and I agree with a lot of it. I am also currently working on a new tabletop rpg, mine has been under going for 8 years now. But with you game and having this “player GM” thing not being rude just don’t know the name you’re using. Its seems more like this is going to hamper the Gm of the game. this critical fail system you have created has a flaw, well to me anyways (who known’s everyone may love it) in my game this critical fail chance that all players share is a great point in the game for the Gm to interact in the battle if things are falling apart on him, or his story is being messed up. now for the most part we all know not to expect are game plans to go as we plan but taking away the Gm’s control of the critical miss takes away his chance to control the story of the game, without making some obvious change to the rules. Example being… Sivin as a character refuses to destroy (something (this something will affect the game)) he rolls a critical during the next battle with a spell of weapon; this crit fail can in turn be used to break the item. This sets the game back on track. Now this is just one example, I have had my story line kept together by crits, the reason why, is players may becomes too powerful and figure your storyline needs to be changed. And without pulling something out of nowhere you cannot control them, crits allows all players weak or strong to show fail. With this fail you can turn the game around, so you are now using the player to keep your story intact. the common argument is “well don’t let them get overpowered” 1) if you have played any tabletop rpg and have been around my family you can turn the entire game around within 6 hours by fallowing the rules to a T. 2) if players can’t beat the odds and become overpowered they fail to feel like they ever have a chance of becoming a hero, and 2/3 players want to brag about how powerful the Char was. Now understand i am not trying to say it won’t work but i will say from Xp that my players have a blast thinking one thing and having another happen to them. Also this post doesn’t seem too old and I wouldn’t mind chatting with someone who has the same career as me. That said if you feel like conversing you can hit me up at incarnum11@hotmail.com. I don’t expect any trade secrets about how your game works; I would rather like to chat about what we have found during our trials of getting these games in the right direction. With any system, of course, the GM has the right to pick and choose what rules they keep. It sounds like you are a big fan of GM control over the story and path of the game. Increasingly, I’ve tended in another direction: giving the players more control. I try to design campaigns that can’t be “thrown off track;” if the players don’t want to play the game the way I thought they would, it’s my job to adapt. My e-mail is available on the “More About Ludus Novus” page, found in the sidebar.